Were Hedge Funds Right About Piling Into Canadian Natural Resources Limited (CNQ)? Is Canadian Natural Resources Limited (NYSE:CNQ) worth your attention right now? The best stock pickers are in a bullish mood. The number of bullish hedge fund bets went up by 1 in recent months. 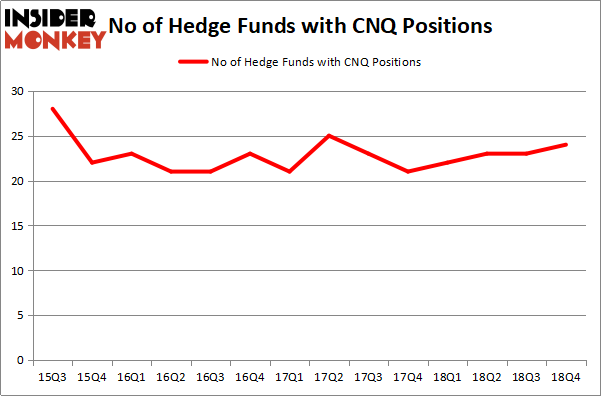 Our calculations also showed that CNQ isn’t among the 30 most popular stocks among hedge funds. Let’s review the new hedge fund action surrounding Canadian Natural Resources Limited (NYSE:CNQ). What does the smart money think about Canadian Natural Resources Limited (NYSE:CNQ)? At the end of the fourth quarter, a total of 24 of the hedge funds tracked by Insider Monkey were bullish on this stock, a change of 4% from the previous quarter. By comparison, 22 hedge funds held shares or bullish call options in CNQ a year ago. With hedge funds’ positions undergoing their usual ebb and flow, there exists a few key hedge fund managers who were increasing their stakes considerably (or already accumulated large positions). Among these funds, GMT Capital held the most valuable stake in Canadian Natural Resources Limited (NYSE:CNQ), which was worth $69.7 million at the end of the third quarter. On the second spot was Polar Capital which amassed $68.7 million worth of shares. Moreover, AQR Capital Management, Citadel Investment Group, and Millennium Management were also bullish on Canadian Natural Resources Limited (NYSE:CNQ), allocating a large percentage of their portfolios to this stock. As industrywide interest jumped, specific money managers were breaking ground themselves. Deep Basin Capital, managed by Matt Smith, assembled the most valuable position in Canadian Natural Resources Limited (NYSE:CNQ). Deep Basin Capital had $24.4 million invested in the company at the end of the quarter. Sara Nainzadeh’s Centenus Global Management also initiated a $6.2 million position during the quarter. 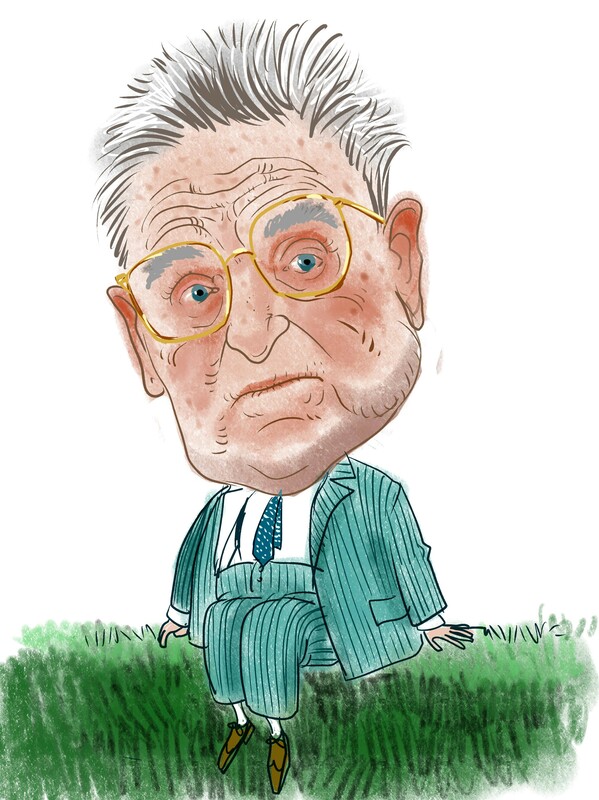 The other funds with new positions in the stock are George Soros’s Soros Fund Management, Arvind Sanger’s GeoSphere Capital Management, and Gavin Saitowitz and Cisco J. del Valle’s Springbok Capital. Let’s check out hedge fund activity in other stocks similar to Canadian Natural Resources Limited (NYSE:CNQ). These stocks are Telefonaktiebolaget LM Ericsson (publ) (NASDAQ:ERIC), Nutrien Ltd. (NYSE:NTR), Yum! Brands, Inc. (NYSE:YUM), and The Allstate Corporation (NYSE:ALL). This group of stocks’ market values match CNQ’s market value. As you can see these stocks had an average of 31.25 hedge funds with bullish positions and the average amount invested in these stocks was $1111 million. That figure was $381 million in CNQ’s case. Yum! Brands, Inc. (NYSE:YUM) is the most popular stock in this table. On the other hand Telefonaktiebolaget LM Ericsson (publ) (NASDAQ:ERIC) is the least popular one with only 25 bullish hedge fund positions. Compared to these stocks Canadian Natural Resources Limited (NYSE:CNQ) is even less popular than ERIC (though hedge fund sentiment is improving). Our calculations showed that top 15 most popular stocks among hedge funds returned 19.7% through March 15th and outperformed the S&P 500 ETF (SPY) by 6.6 percentage points. Hedge funds were also right about betting on CNQ, though not to the same extent, as the stock returned 14.9% and outperformed the market as well. Were Hedge Funds Right About Flocking Into Sempra Energy (SRE)? Here is What Hedge Funds Think About BT Group plc (BT) Hedge Funds Dropped The Ball On Fortive Corporation (FTV) Here is What Hedge Funds Think About AutoZone Inc. (AZO) Is IQVIA Holdings, Inc. (IQV) A Good Stock To Buy? Were Hedge Funds Right About Souring On Canon Inc. (NYSE:CAJ)?